Qualified scramblers and climbers are invited to join the Everett Branch on trips to many spectacular Cascade and Olympic peaks. For those interested in learning or instructing, our courses teach the necessary skills with an emphasis on preparation, teamwork, fitness, and safety. Alpine Scrambling is strenuous, off-trail travel over snow and rock with a mountain summit as the objective. The terrain may be steep, exposed, and/or brushy, but not to the extent that ropes are required. We carry ice axes for self-arrest and wear helmets for protection from rockfall. The scrambling experience falls somewhere between hiking and climbing both in required skills and expected risks. Note: Technical terrain using ropes and protection is part of "Climbing" in the Mountaineers. This includes class 4 and 5 rock, and glacier travel. We always carry the ten essentials . Our course teaches you how to travel on snow using an ice axe. And we'll show you how to safely travel on rock, too. The Everett branch class sizes are fun, supportive and relatively small. Sign up for scrambling starts in the fall with the first lectures beginning in February. Contact the committee chair with additional course questions. If you have your "Scrambling Badge" or "Climbing Badge," sign up for one of our Everett Branch scrambles ! You must be a graduate of the club's climbing or scrambling courses. Winter scrambles require a bit more gear, such as snowshoes, crampons, avalanche beacon, shovel & probe. Your leader may require extra equipment. We have an awards program to encourage participation in club scrambles. They include sets of easier or harder peaks, and elevation gain. We'll take any excuse to justify the uphill work! 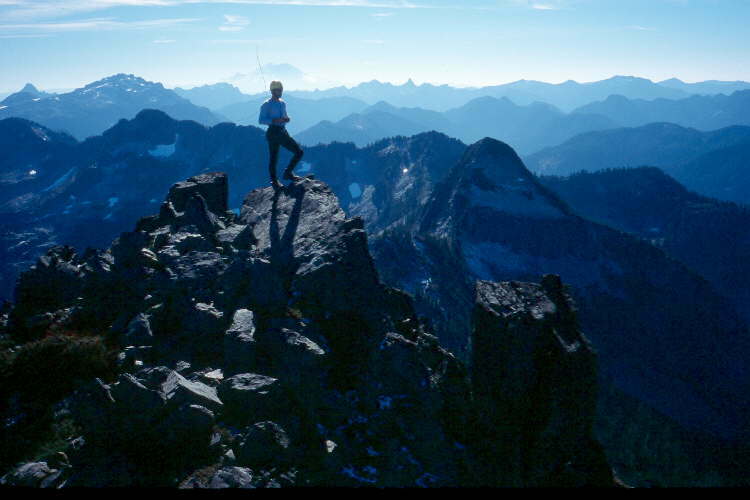 We have a great variety of peaks in the Cascades and Olympics! This list include snow, rock, and mixed. Even though snow closes many high mountain roads, there are many easily accessed summits to enjoy. Check out all of our "Routes and Places" from a scrambling perspective! Volunteering to help with courses, seminars, and scrambles is a great way to keep your skills set up, and give back to the mountaineering community. The committee meets at 7 p.m., on the second Monday of each month. Contact scrambles@everettmountaineers.org for schedule and location information.